The Internet makes it easy for recipients to share press releases, which is a good thing for spreading your message but a bad thing if the press release isn’t one of your best and it’s shared in the context of being mocked. The press release is a fickle beast: Crafting, distributing, and seeing results from one brief news blast can seem like both the most important PR task and the most ineffective one. But somewhere along the way, the press release has turned from valuable news distributor into ubiquitous email blast. So what should you do if you find that one of your press releases has been eviscerated online by one of its recipients? Publicly, probably nothing, unless someone called it out on a national stage – like Stephen Colbert did. If the person who mocked your press release uses your organization’s name online in an especially negative context, it may be tempting to ask them to take it down. But most journalists won’t react to that well, and relations may further sour. Instead, politely ask the author to remove or redact the name of your organization. Conversely, use the publicity to your advantage. Embrace the fact that the press release got attention, and use it to get more attention for your next press release. Issue a brief humorous and self-aware statement and ask that it be included in the entry about your press release. When crafting such a statement, ensure the statement is appropriate to your organization’s culture. Keep tone in mind; if your organization’s material tends to be formal, the statement should be too. Run the statement by a few key people to ensure it strikes the right tone. Finally, do some internal inventory as to why the press release was received with derision rather than excitement. Was the message properly targeted to its recipients? Did the press release make sense to people outside the industry? The headline is the first thing people see, and a headline that’s confusing, off-putting, or just plain bad means your press release is starting at a huge disadvantage. Quick tips: keep headlines short. – preferably fewer than 65 characters. Buzzwords and jargon won’t help you stand out – the PR industry’s most overused buzzwords won’t differentiate your press release. Plus, to people outside your industry, industry jargon just sounds like nonsense. Quick tips: Find other words for “innovation,” “solution,” and “leading,” and variations thereof. Recall that brevity is the soul of wit; if you can say it in fewer words, do so. The longer a press release, the more likely it is that the writer is struggling to explain everything. Quick tips: Stick to the facts. List the most important points to convey, and lead with the most important one. For writers on deadlines, time is short, and receiving an error-filled press release is both frustrating and a waste of time. Quick tips: Proofread your press release, then have someone else proofread it. 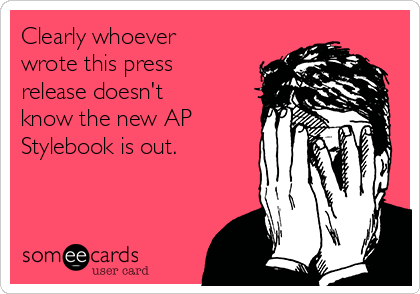 Familiarize yourself with AP style, which is considered the media style standard, and stick to it. Check out more of our tips for crafting better press releases.